"VCI's Blu-ray…is seriously flawed, though the company presently seems aware of the problem and is working to fix it in the form of eventual replacement discs. Basically the film source elements appear to be in decent if not stupendous shape, but during the authoring stage somebody messed up. The image, while clearly better than any previous home video version, is rife with what VCI describes as 'vertical jaggy' or aliasing, i.e., when straight lines instead resemble jagged little steps. This might be invisible on smaller monitors but on my 90v projection system it's highly noticeable." Happily, that's been corrected and the replacement discs are now in circulation. One Million B.C. was a hard-to-find title - I think I last saw it in the early days of VHS - though stock footage (actually mostly outtakes) from the film turned up in innumerable cheap ‘50s sci-fi pictures. It was a production of Hal Roach Studios for release through United Artists, one of a comparative handful of feature films the company made that didn't star Laurel & Hardy. Producer Hal Roach realized from the earliest days of talking pictures that the market for short comedies of the type in which his company excelled and specialized (Laurel & Hardy, Our Gang, Charley Chase, etc.) was drying up. Profits on all but the most popular were always pretty marginal, and bigger studios he, Mack Sennett and others relied on for their distribution were cutting out the middleman by producing shorts on their own. Roach countered by easing into the feature film market, with his biggest attractions, Laurel & Hardy, leading the way. Roach, however, struggled trying to make features out of his little studio that could compete with the glossiness of big companies like MGM and Paramount. By 1940 his relationship with Stan Laurel had irreversibly soured and Laurel & Hardy left Roach for what they thought would be greener pastures at Fox. Roach had also parted ways with MGM, his distributor since 1927, partly the result of a public relations disaster after Roach briefly partnered with Vittorio Mussolini, son of the Italian fascist dictator, to co-produce features. Roach signed away his rights to Our Gang to MGM (who promptly ruined that fine series) and began distributing through United Artists. Roach seemed to have a two-pronged plan: produce classy "A" features and "B" streamliners, movies running 40-50 minutes, longer than the longest shorts, but shorter than the usual 60-70-minute feature. His early offerings in the former category included a handful of good movies, particularly Topper and its two sequels and Of Mice and Men (1939), an extremely good adaptation of Steinbeck's novel. 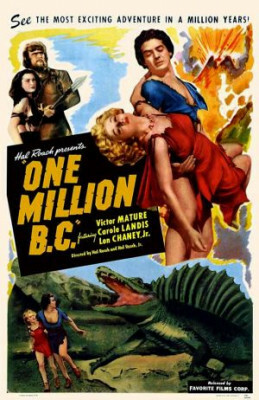 In the midst of all this came One Million B.C., an ambitious novelty film about cavemen and dinosaurs, packed to the gills with elaborate special effects, and its story told almost exclusively in pseudo caveman lingo, enabling the film to be shown and understood anywhere in the world. The movie, of course, was eventually eclipsed by its glossier remake, One Million Years B.C. (1966), with its stop-motion effects by Ray Harryhausen and the eye-pleasing sights of Raquel Welch in her fur-skinned bikini. The picture opens with a present-day prologue, Roach hedging his bets by easing viewers into the prehistoric main story. Young (Swiss?) mountain climbers seeking refuge from a torrential rainstorm stumble upon a cave where an archeologist (Conrad Nagel) has been interpreting ancient cave drawings. To pass the time, the climbers request that he interpret the drawings, which he does, drawing parallels to two of the travelers (Victor Mature and Carole Landis). The Rock Tribe, brutally led by chief Akhoba (Lon Chaney Jr.), permits son Tumak (Mature) the right of first kill, a baby Triceratops, which is roasted in their cave. When Akhoba tries to steal Tumak's portion late in the meal, they fight and Tumak falls off a cliff, chased by a Wholly Mammoth and knocked unconscious, he lifelessly floats downriver. Loana (Landis), of the far more civilized Shell People, finds him. There Tumak, is welcomed by the communal cave people, who share and share alike, farm vegetables and spear fish for their food, all alien concepts to Tumak's earlier, unforgiving, survival-of-the-fittest lifestyle. One of the fascinating aspects of One Million B.C. is how exactingly whole scenes were recreated for the British-made remake, sometimes to the tiniest detail. The roasting of the day's kill and the tension as it cooks and methodically is distributed is copied so exactingly one can only assume the original film was carefully examined and storyboarded for that film's director to recreate. Even Robert Brown's makeup clearly imitates that worn by his counterpart in the original, Lon Chaney. Another long sequence, of Tumak shaking fruit off a tree for the Shell People children, them following his lead, Loana trying to teach Tumak how to spearfish, and the subsequent attack of the Allosaurus are likewise nearly identical. The remake made some deletions and additions to that script, most of which improved that film, though the 1940 version is a little better in few other ways. The Rock Tribe in the original film has a large population of children, realistic considering the high mortality rate among them. Obviously Ray Harryhausen's stop motion effects allows for more authentic looking dinosaurs, but what really helps make the remake better than original, if any single component could be responsible, is Mario Nascimbene's musical score, which is so striking and evocative as to set the proper mood in ways Werner R. Haymann's score in the original does not at all. The use of real, optically magnified animals (mostly reptiles) has been done in both cheap and expensive films (Journey to the Center of the Earth for one), but never better than here. Roach Studio's unsung technical genius effects director Roy Seawright had mostly done the occasional optical effect for two-reel comedies here and there, but his work was always unusually flawless. One Million B.C. must have at least a hundred individual effects shots, and they're rarely less than excellent. It's probably the most ambitious, effects-heavy film made between King Kong (1933) and Mighty Joe Young (1949). I can't think of a movie made in-between that combined that volume of work with that high level of quality. In short, VCI's replacement Blu-ray addresses and fixes the problems with the original offering. The surviving film elements aren't perfect, but this is a huge improvement over all previous TV and home video versions. The PCM mono (with optional English subtitles) fared better. Supplements include a commentary track by Toby Roan, and an exhaustive image gallery. VCI deserves a lot of credit for acknowledging the problems of their first release, and correcting it at no cost for consumers, something larger labels often don't do, with Universal being particularly bad during the days of DVD-18s. The movie is loads of fun and Highly Recommended.